A real treat to go to Ford's Theatre, sit under the box where President Lincoln was assassinated a bit more than 153 years ago, and listen to a conversation between historian Kate Masur and journalist Michele Norris. Topic: Masur's re-publication of the book They Knew Lincoln by John E. Washington. She explained how Washington came to work on the book in the 1930s and have it published by E.F. Dutton in 1942. Washington (1880-1964) was an African American teacher, historian, and Lincolniana collector. (Yes, it's been a thing for a long time.) His first connections to history, according to the book and Masur's new introduction, came from stories he heard from old-timers in his grandmother's home right near Ford's Theatre. Many of them had contact with the Lincolns as employees, neighbors, observers, and in other capacities in the decades prior. One of the accounts he would have heard was about Elizabeth Keckly, Mary Lincoln's African American dressmaker and friend, who lived until 1907. He kept those stories with him as he went through Howard University and settled within Washington's black community in the 1920s and 1930s as a teacher at Cardozo High School. In 1935, a white writer named David Barbee told a Washington Star journalist that Keckly's account of her time with the Lincolns, called Behind the Scenes, was a work of fiction--as was Keckly herself. (Many of you may recognize a similar claim about Harriet Jacobs, author of Incidents in the Life of a Slave Girl). Elizabeth Keckly, Whose purported non-existence spurred Washington to write his book. Washington, and many others, set the record straight by calling the Star; Washington's letter to the editor was published and the journalist, to her credit, wrote a second article. According to Masur, this incident led Washington to collect the accounts of the many other blacks who "knew Lincoln" before the stories were completely lost, focusing on people in the Washington area but also going back to Illinois. Another consideration that Masur pointed out: Shortly after Lincoln's death, his former law partner William Herndon had collected the memories of hundreds of people who "knew Lincoln"--all of them white. 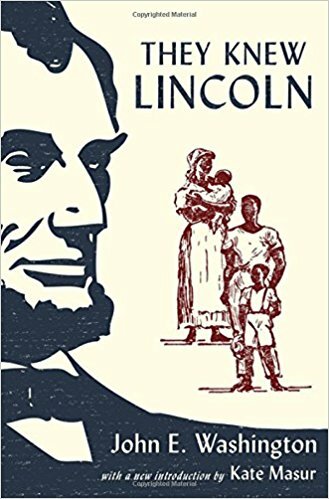 It does seem surprising that he would not include Lincoln's valet, William Slade; his barbers in Washington and Springfield; and other African Americans who were in close contact with the Lincolns, or maybe not so surprising for the time. Washington enjoyed the search perhaps as much as writing the book. He tells of his research trips, often taken during his summer vacations from teaching, his contacts with Lincoln scholars and others in the world of Lincolniana, and his unexpected discoveries of connections. A frequent stop was the Rare Book room in the LIbrary of Congress, where the librarian ended up serving as his literary agent and conduit to the New York publishers. Masur brings us up to date about what happened after the book was published--strong reviews in both the black and mainstream press, sell-out of all copies of two printings of the book, but no further printing or second book for Washington. The reasons ranged from the death of the agent (and falling-out with his widow) to the country's preoccupation with World War II. To the mainstream scholarly set, the first edition seemed touching and represented a new set of voices, but they expressed less interest in anything more. John Washington and his wife Carolyn did not have children. So there are no direct descendants to take pride in the re-publication of the book and the deep interest it engenders. (Ford's Theatre was filled for the lecture, on a Monday at 5 pm.) The book is a joy, and Masur's introduction helps put it in context for how ground-breaking it was, and is. Side note: This past September, I was in Chicago at the Abraham Lincoln Book Shop for an interview on the store's House Divided webcast. I had been in communication with Masur, who teaches at Northwestern, and knew about her project. I mentioned it to owner Dan Weinberg, who showed me a rare copy of the original 1942 edition.